A hollow concrete building block. The CMU system allows for masonry walls to be built in a range of sizes and applications including the use of reinforced concrete vertical cores and horizontal and sloping beams. A mix of concrete designed to fill the cavity of cavity brick walls from the foundation to the damp proof course level. 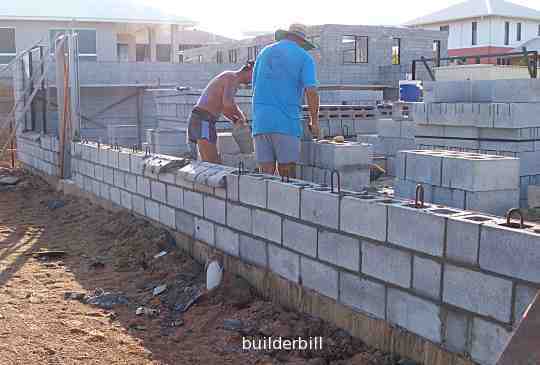 I live in a cyclonic area so this form of building walls is very popular. This modular hollow block system allows for great flexibility in design, but more to the point it is tremendously strong. The photo above shows block-layers building a 200 series (8") external reinforced wall onto a raft slab. The slab has N12 starter bars already cast into it and the blocks are laid over them. In the background can be seen pallets of various block types. Some 100 series (4") for internal walls and some some knock out blocks that can be used for bond beams and lintels above openings. 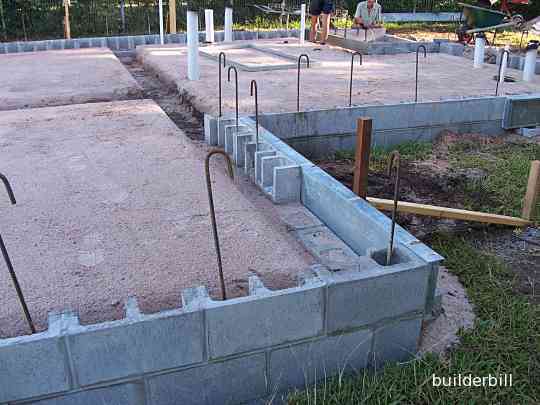 This photo show blockwork that has been laid on concrete strip footings. Where it come to the floor slab level "E" blocks are used to allow the reinforcing steel, mesh and concrete to sit on top of the already corefilled wall. Note that in this type of construction ALL the cores are filled up to the ground floor slab. Concrete Corefill consists of a specific mix of concrete that is designed for pumping and filling these cores. It has to run freely down the cores and sideways over and under openings. It may have a plasticising additive and a higher water ratio than normal concrete. Corefill uses a maximum 10mm aggregate and it's strength is normally 15mPa.